The Samsung Galaxy Watch is currently getting its first discount since it launched in August, with the Galaxy Note 9. The Samsung Galaxy Watch is currently on sale over at Amazon and Samsung’s website, starting at $299. The 42mm model is $30 off, bringing it down to $299, while the 46mm model is also discounted by $30 and bringing that one down to $319. The 42mm model of the Galaxy Watch is available in Rose Gold and Midnight Black, while the 46mm model is available in silver only. Samsung’s Galaxy Watch is the company’s latest smartwatch, and it debuted just a couple of months ago. So seeing it get a discount so soon is rather surprising, and also a great time to jump on-board and grab one to put on your wrist. Like the previous Gear smartwatches, the Galaxy Watch does also run on Tizen, so you’re not getting a Wear OS-powered smartwatch here, which is probably a good thing. The Galaxy Watch has a ton of apps that you can install and use, without even needing your phone around. The Galaxy Watch does work with all Android smartphones and most newer iPhones, so no matter what smartphone you have, the Galaxy Watch will work perfectly fine with it. There are a ton of different watch faces that you can use to really customize the Galaxy Watch as well. In fact, there are a few apps out there that you can use to really create your own watch faces. The Galaxy Watch is more than just a smartwatch though. It can also function as a fitness tracker. 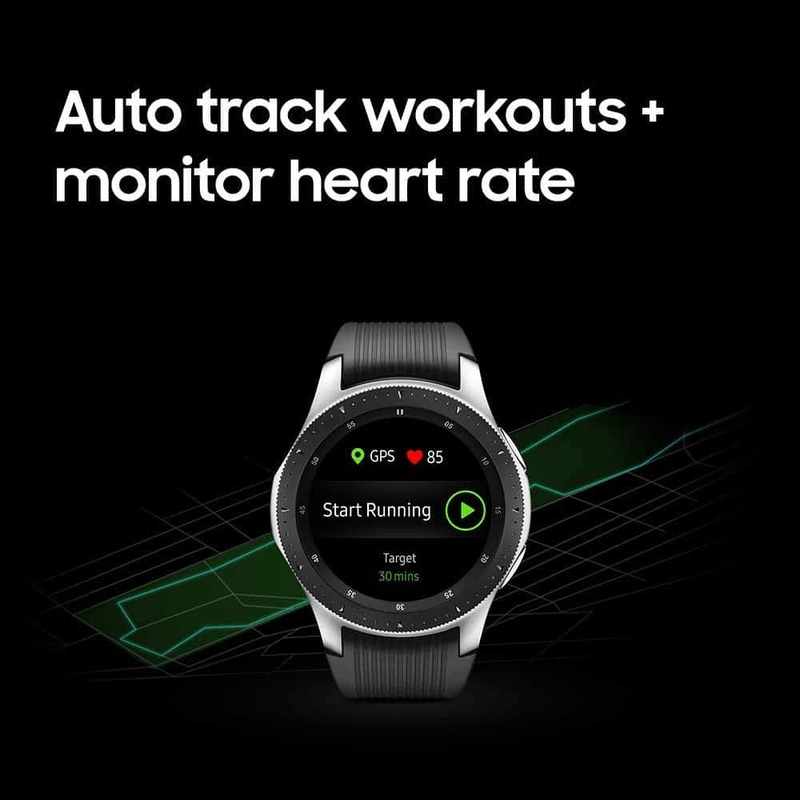 Thanks to Samsung Health, it can track your steps taken, workouts, calories burned, and much more. New this year, the Galaxy Watch is also waterproof and can track swimming. So if you are one that likes to go swimming a few times a week, instead of the usual running that most people do, the Galaxy Watch can track that for you as well. Samsung has the rotating bezel on the Galaxy Watch as well, which makes it much easier to navigate the operating system and get things done. This is something that other smartwatches have failed to add, and it really shows. Samsung is also promising some pretty stellar battery life out of these smartwatches. About three days on the 42mm version and almost four days on the 46mm version. You are reading an article on the Deal: Samsung Galaxy Watch Discounted To $299 At Amazon & Samsung.com – October 2018. All materials on the site Gadgets F, а также и статья Deal: Samsung Galaxy Watch Discounted To $299 At Amazon & Samsung.com – October 2018 - written for the purpose of information enrichment and we are happy if you like our magazine.